MIL MASCARAS (whose real name is Aaron Rodriguez) was born in Mexico City in 1939, and became a professional wrestler and movie star almost overnight in 1965 (at the age of 26). At that time, the athletic young man had been considering trying out for a spot on the Mexican Olympic team in judo, but after deciding to wrestle instead, he quickly became an overnight sensation. Vergara's two regular "movie stars" had suddenly become unavailable... SANTO had walked out on him over a contract dispute, and BLUE DEMON was injured unexpectedly and would require a prolonged "time out". Not wanting to stop making his successful cinematic quickies, Vergara decided to transform Lucha Libre newcomer MIL MASCARAS as the star of his next two movies, and the rest was history. Mil began a movie career that continued for the next 24 years, appearing in a total of 17 Mexican horror/wrestling/action films. The name MIL MASCARAS means "a thousand masks", and he lived up to that name, allegedly wearing a different mask in every match. Some people estimate he actually used only 50 different masks in all, but who's counting? The first film, simply entitled "MIL MASCARAS" (1966) was shot in black & white, and made Mil out to be some sort of super-hero! The film gave Mil Mascaras a "comic book-type" origin story, which seems to have been somewhat swiped from the then-popular "DOC SAVAGE" pulp novels that were selling very well in science-fiction bookstores in the mid-60's. According to the script, Mil was an infant who was found clutched in his dead mother's arms in a war-torn area of Europe during World War 2 and was sent to an orphanage. A group of scientists (not affiliated with any particular country) adopts the boy, secretly using him as a guinea pig, subjecting the child to an intensive regimen of physical exercise and mental training as he matures. When he reaches adulthood, Mil is something of a superman (although without actual super powers); both his mind and his body have been developed to perfection. The scientists then send him out into the world to help downtrodden people everywhere, to fight criminals and to right wrongs, and just basically help make the world a better place. The only problem is, the plots of the first two films (which are somewhat connected story-wise) are rather lackluster. In both "MIL MASCARAS" (1966) and its sequel "LOS CANALLAS" (also 1966), Mil gets to fight a rather ordinary gang of thugs and a crooked fight promoter who are bullying the locals in some backwater burg in Mexico. Couldn't the scientists find anything more important for their "wunderkind" to do? (By the way, Mil's second film "LOS CANALLAS" (and all of them thereafter) was shot in Color). Federico Curiel directed Mil's next two films in '1968, both of which feature American horror star JOHN CARRADINE as a bad guy. Mil's missions were becoming a bit more meaningful by this time. In "ENIGMA OF DEATH", Mil faces off against Carradine who plays the leader of an underground Nazi organization, while in "LAS VAMPIRAS", Mil goes up against a secret cult of female vampires whose Dracula-like leader is.....(you guessed it) John Carradine! In 1970, Curiel directed Mil in two of his greatest "teamup" movies. "THE MUMMIES OF GUANAJUATO" teamed Mil up with both Blue Demon and El Santo in what became the highest-grossing Mexican wrestler film of all time, pitting the three enmascarados against a group of reanimated mummies! However in 1973, he teamed up again with Tinieblas and El Fantasma Blanco in two more films, "MACABRE LEGENDS OF THE COLONY" and "THE MUMMIES OF SAN ANGEL" (which both resemble "Champions Of Justice" films, in spite of the Blue Demon's conspicuous absence from the casts). "THE THEFT OF THE MUMMIES OF GUANAJUATO" (1972) teamed up Mil with the Blue Angel and El Rayo De Jalisco. Mil also appeared in a solo movie of his own, "A ROSE IN THE RING" (1972) and years later, he even teamed up with the Son of Santo in "THE LAWLESS FRONTIER" (1983), making Mil Mascaras the only Mexican superhero to ever co-star with both Santos, father and son. 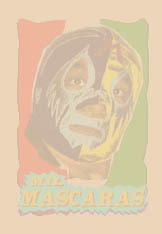 Mil Mascaras still has a wrestling career today, even though he is now over 60. He has many fans around the world, and his films are avidly collected by wrestling/horror movie buffs to whom he has become a "cult figure". It's a shame that not a single one of his movies has ever been dubbed in English.